08.27.14 On August 26, 2014, Plymouth State University hosted a ceremonial groundbreaking for the ALLWell North project, which includes 107,000 square feet of athletic and teaching spaces. This state-of-the-art facility will be a focus of PSU's advancement of the teaching of physical wellness on campus, as well as serve as a community center for the greater Plymouth and Holderness public to experience and enjoy. Read here for the PSU announcement of the event. 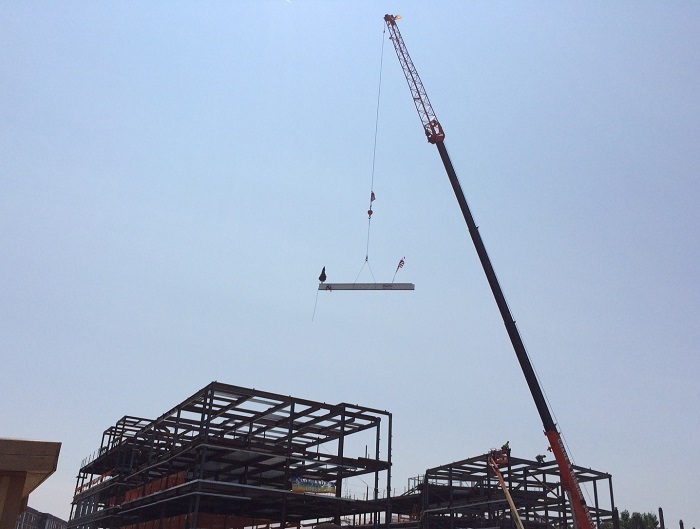 08.22.14 On August 5th, LeMessurier Associate Chad Pecsek and engineer Congyi Qian joined Salem State University, William Rawn Associates and Turner Construction in celebrating the completion of structural steel erection with a Topping Off ceremony. 08.17.14 NECN (New England Cable News) presented a weekend profile of the STEM (Science, Technology, Engineering & Mathematics) initiative being undertaken for all ages in the state of Vermont. Shown off as the culmination of the STEM process is the development of an expansive STEM facility at the University of Vermont. LeMessurier is actively collaborating with architects Freeman, French, Freeman of Burlington, VT and Ellenzweig of Cambridge, MA on this ambitious project at UVM.